This remarkable picture book inspires both through its message and through its very existence. Retired arborist Gregory Ahlijian has been volunteering at the Jasper Mountain facility for abused children for several years. The students he has encountered there (ages 6 to 13) inspired him to write this picture book about overcoming adversity. Ahlijian financed the printing, the editing, and the remarkable artwork by Janna Roselund and is now donating the full retail price to Jasper Mountain. 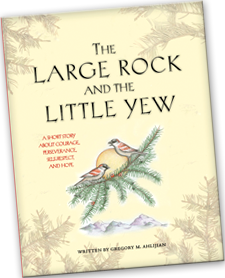 The Large Rock and the Little Yew tells the story of a yew seed that falls into a deep crack in a large boulder. When the seed begins to sprout, the boulder continually insists that it will never survive in the outside world. In the end, the yew overcomes the odds and grows into a large tree with roots that surround the boulder. An actual tree in England served as a model for the story; a photo appears at the end of the book. Ahlijian draws on his professional knowledge of trees in crafting what is really an extended parable. He also infuses it with the values he works to impart to the young people he mentors at Jasper Mountain: respect, confidence, thankfulness, courage, determination, kindness, generosity. The Large Rock demonstrates that hardships are not just obstacles to be overcome; they provide opportunities to grow and develop strength. The Epilogue points out that were it not for the rock, the yew tree would be just another tree in the forest, rather than an awe-inspiring testimony to the power of nature. On April 28 from 3 to 5 p.m., The Book Nest (inside Indulge! at 1461 Main St., Springfield, OR) will host a reading and signing with Ahlijian. In addition, we will raffle off an original painting by Springfield artist D. Brent Burkett, the proceeds of which will also benefit Jasper Mountain. More information about Ahlijian’s book is available on his site: http://www.littleyewtree.com/.